A friend of mine who is a Seventh-day Adventist sent me the following four texts regarding Jesus’ baptism. He believes these four texts clearly show three separate beings. Do these texts reveal that God is a Trinity? 3) Jesus was baptized by immersion (three separate beings). Luke 3:22; And the Holy Ghost descended in a bodily shape like a dove upon him, and a voice came from heaven, which said, Thou art my beloved Son; in thee I am well pleased. John 1:32; And John bare record, saying, I saw the Spirit descending from heaven like a dove, and it abode upon him (3 person Godhead]. Let’s prayerfully study these texts. Points #3 and #4 are the key points. Trinitarians and non-Trinitarians have no disagreement with points #1 and #2 that Jesus was baptized and that the heavens were opened unto Jesus. My friend is communicating to me that this text proves that there are 3 separate beings in the Godhead. In other words he is saying that this could not be the Spirit of the Father and the Son but must be a separate Holy Spirit being apart from the Father and the Son. Question: Can I honestly say that this text proves the Spirit of God is a separate being different from the Father and the Son? Answer: No I cannot say that. “The Spirit of God” = A separate being apart from God the Father and His Son Jesus Christ. 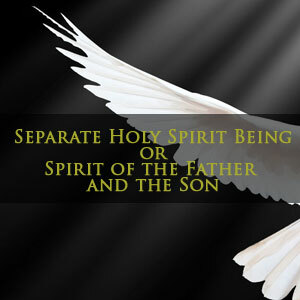 Question: Is the Holy Spirit a separate co-eternal being or is the Holy Spirit the Spirit of the Father and the Son? The third person of the Godhead (Holy Spirit) is divested of the personality of humanity. To be divested of something is to be stripped of something.Example. “He divested himself of his coat and trousers, the prince undressed.” A person has to have “coat and trousers” to divest them. The Desire of Ages quote is telling us that the Holy Spirit had the “personality of humanity”. Does the Bible show another divine being apart from Christ having the “personality of humanity?” No Jesus Christ had the personality of humanity (Son of man). “By the Spirit the Saviour would be accessible to all.” Jesus Christ would be nearer to us. This is what the Desire of Ages quote is saying. Please read it again. Do you see it? “He (Jesus) would be nearer to them.” This quote reveals the Holy Spirit is not a separate being apart from Jesus. Question: Who comes personally by His Holy Spirit? Question: Is the Holy Spirit the Spirit of Christ? Question: Is the Holy Spirit Jesus Christ? Question: Is the Lord that Spirit? Question: Are you saying that I should now see Jesus Christ as my Comforter? Question: Can Jesus be ministering in the sanctuary above and yet still be on earth by His Holy Spirit? Question: Perhaps people are now saying. “Well Jason, that doesn’t make any sense. Are you saying that in Matthew 3:16 the “Spirit of God descending like a dove, and lighting upon him” is actually talking about Jesus and the Father and not a separate being? Answer: Yes and Ellen White is saying the same thing. Allow me to share a few quotes to help you see the truth of this verse. There are precious treasures of truth here if one will set aside preconceived ideas. The dove at Jesus’ baptism does not point to a Trinity nor does it point to a separate co-eternal being. The dove is pointing to your meek and gentle Savior. Let’s continue shall we? They key phrase in Matthew 3:16 is “Spirit of God.” Typing into the E-Sword Bible program I came across 26 verses that have “Spirit of God” in them. Will these texts lend evidence in favor of a separate third being or provide weight that the Spirit of God is the Spirit of the Father and the Son? Did you see anything as you went and read all the Bible references talking about the phrase “Spirit of God?” Two verses stood out for me and I highlighted them in blue. One of the major characteristics of Hebrew poetry is parallelism. There are many kinds of parallelism. Synonymous parallelism describes bicola or tricola in which the same or similar thoughts are repeated. The “Spirit of God” is the SAME or SIMILAR thought as “breath of the Almighty”. This lends evidence that the Spirit of God (Holy Spirit) is NOT a separate being. The “Spirit of God” and the “Spirit of Christ” are used interchangeably. This is significant. This is another piece of evidence to me that the Spirit of God (Holy Spirit) is NOT a separate being from the Father and the Son. After reading all 26 verses I don’t have anything solid that tells me the “Spirit of God” is a being that is separate from God the Father or His Son Jesus Christ. The “Spirit of God” looks to me like it is truly the SPIRIT…..OF……GOD. I hope you will not discount this information because popular preachers of our day teach the Holy Spirit as another separate co-eternal being.